BANG! 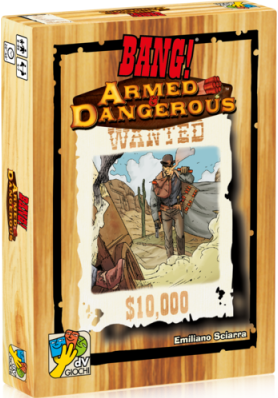 Armed & Dangerous holds many surprises for players of the BANG! card game: deadly weapons, powerful gear, and lethal ammo — which are all Dangerous cards. During the game, you can add load tokens to your Dangerous cards and your character, which you can use to activate your Dangerous cards, use the abilities of some characters, or upgrade the effects of some brown-bordered cards! To reload a Dangerous card, you have to play a blue-bordered card or discard a card from your hand at the end of your turn. Then it will be ready to unleash on your rivals!